Somebody's Gotta Do It - . If that couch was green, I'd swear this was my living room. The sound Lego makes when it's dumped en mass surely must be the same sound the gates of hell make when opening. Hahaha, I second highlyirritable's comment... only my couch is blue. I can't wait to see them all sorted. Wow. OK, tell me what system you're using..b/c we have a MESS here. I'm sure you're glad that you're not the "somebody" Lisa. The journey of a thousand miles starts with a single Lego. Is this what I have to look forward to? I bought T one little Lego set...now I'm terrified it's going to turn into - THIS. 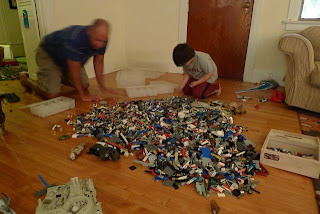 I know this has to be done and my son and I did this years ago but something unexpected happened: he stopped playing with them as much. Well, I guess he was 14 by then. But still, I recommend an unsorted container too. Holy crap! I had 3 brothers and they only managed to accumulate about 25% of that. Even the nephews and nieces were completely satifisfied with the hand-me-downs. Ah, the spoils of battle. We JUST did the same thing in our house last month. Went to Home Depot and bought organizee boxes in the tool section. And can I just say that sadly he has not played with them since. Huh. ~~~wow......very very impressive lego pile. haha. Nice Bob. It's fun to have a kiddo in the house. There is someone who will mess out, and will also help you fix the mess, he will also be funny, but eventually you (his parent) will be the one to fix the mess he made.haha. Love this post.